February is National Heart Health month, and did you know your heart and brain health are directly related? As part of the Canadian Consortium on Neurodegeneration in Aging (CCNA), researcher Dr. Carol Greenwood and her team have been studying how lifestyle can become a risk factor for dementia, and whether changes to lifestyle – even later in life – can lower that risk. “Thankfully, we can say that lifestyle, which includes activity and diet, absolutely impacts both the heart and the brain,” explains Dr. Greenwood. Our heart is a chief contributor to making sure the brain receives a healthy flow of blood. Therefore, anything that we can do to maintain a healthy heart will lead to better brain health. What’s more, when groups of people with cardiovascular issues improve their lifestyle through diet and activity, that group also experiences improved cognitive function. 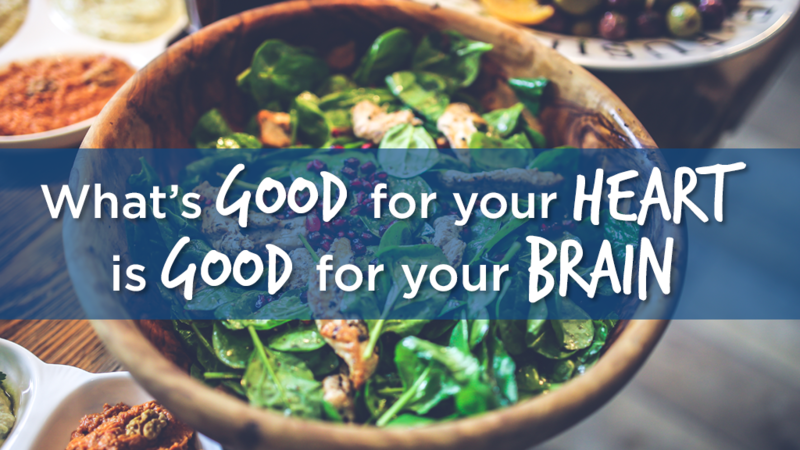 What are some ways that you can impact your brain health through diet? Limit the consumption of meat in favour of a more plant-based diet. Legumes are excellent brain-healthy alternatives to a meat-centered meal. A 2015 study has pointed toward nuts, and particularly walnuts, as a great part of a brain-healthy diet. Try snacking on walnuts during the day, or using a nut butter on your toast for breakfast! Stay away from hard animal fat by limiting consumption of meat, and opting to bake your meal instead of frying it. This includes limiting the consumption of animal products such as cheese, eggs and animal fats such as lard. Pastries and confectionaries can contribute to higher LDL cholesterol levels, so be aware! © 2009 Oldways Preservation & Exchange Trust, https://oldwayspt.org. In 30 minutes or less, make a delicious, brain-healthy meal that is high in healthy fats and full of flavour! Click here to access this mouth-watering recipe. Go ahead, try this recipe and let us know what you think. [i] Hardman, Roy J. et al. “Adherence to a Mediterranean-Style Diet and Effects on Cognition in Adults: A Qualitative Evaluation and Systematic Review of Longitudinal and Prospective Trials.” Frontiers in Nutrition 3 (2016): 22. PMC. https://www.ncbi.nlm.nih.gov/pmc/articles/PMC4956662/. Web. 18 Dec. 2017. [ii] Cinta Valls-Pedret, Aleix Sala-Vila, Mercè Serra-Mir, Dolores Corella, Rafael de la Torre, Miguel Ángel Martínez-González, Elena H. Martínez-Lapiscina, Montserrat Fitó, Ana Pérez-Heras, Jordi Salas-Salvadó, Ramon Estruch, Emilio Ros. “Mediterranean Diet and Age-Related Cognitive Decline: A Randomized Clinical Trial”. JAMA Intern Med. 2015;175(7):1094–1103. doi:10.1001/jamainternmed.2015.1668. Web. 18 Dec. 2017.